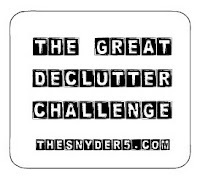 My friend Molly over at The Snyder 5 has been hard at work decluttering her house. And today, she invited others to join in the fun! The problem? I already decluttered our spare bedrom yesterday, but I didn't take any "before" pictures. I simply hadn't planned on blogging about it! The Backstory: Our spare bedroom is our home's "what the heck should we do with this stuff that doesn't belong in the basement" dumping ground. (Every house has one, right?) The mess got totally out of hand when workers installed a hood vent in our kitchen. You see, the exhaust pipe had to run through our upstairs linen closet, forcing us to remove its contents until we recut the shelves to accommodate the pipe. Where did all of the linen closet stuff go? Into our spare bedroom, of course! For the past several weeks, the room has been full of extra shampoos, cleaning products, towels, toiletpaper and lots of other random stuff. The Complicating Factor: Making matters worse, we still haven't refinished and reinstalled the door to this room. So the clutter is in full view (and full reach) of anyone who comes upstairs. When we had my nephew overnight last week, we actually blocked off the room with the loveseat. Lovely, eh? The Resolution: On Saturday, Kyle cut all of the shelves to fit around the exhaust pipe. Then I got to work sorting through the mess, throwing away junk and restocking the shelves. It didn't take long before we could see the floor again! Overall, this was a huge decluttering success. I feel so much better when I reach the top of the stairs now! Final Notes: I won't be weighing my tossed/donated clutter like Molly does. We don't have a scale! But we'll definitely be ridding our home of clutter, not just reorganizing the clutter. Hope you join us! Super impressed. And am still laughing about the couch blocking the door. The image of you and Kyle moving it to block the door is the best part! Jamie, you should share your efforts on your blog and link up on The Snyder 5 site! It's fun to see what others are doing!